Warhammer fans would surely recognize the seemingly fantastical motifs of liturgical texts being embedded along dresses in the ‘grim future’ of 40,000 AD. As it turns out, like much of the stuff that have inspired the Warhammer 40,000 universe, the case of the liturgical texts and clothes has its unique basis in real history. 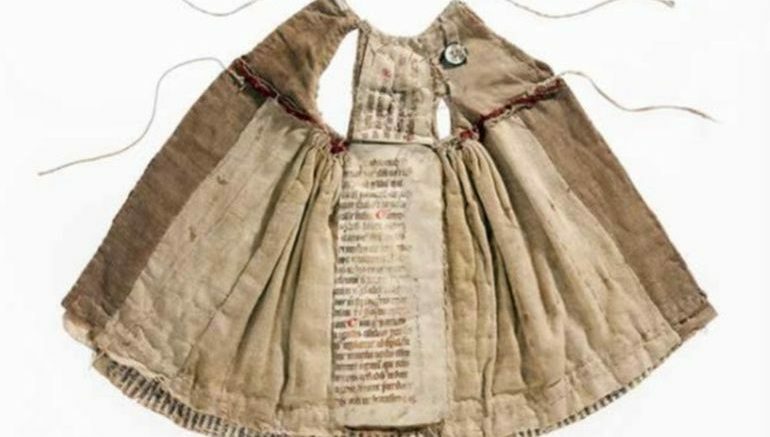 To that end, a research conducted in 2011 unveiled how fragments of medieval manuscripts were actually used as dress linings at the Cistercian convent of Wienhausen in Northern Germany. Evoking the imagery of Battle Sisters, these dresses (one pictured above) were made by the 15th century nuns at the institution for draping the various statues of the convent. To achieve drapery-like folds in the fur, the nuns stiffened the hems by lining them with strips of parchment gathered in folds by means of a thread. 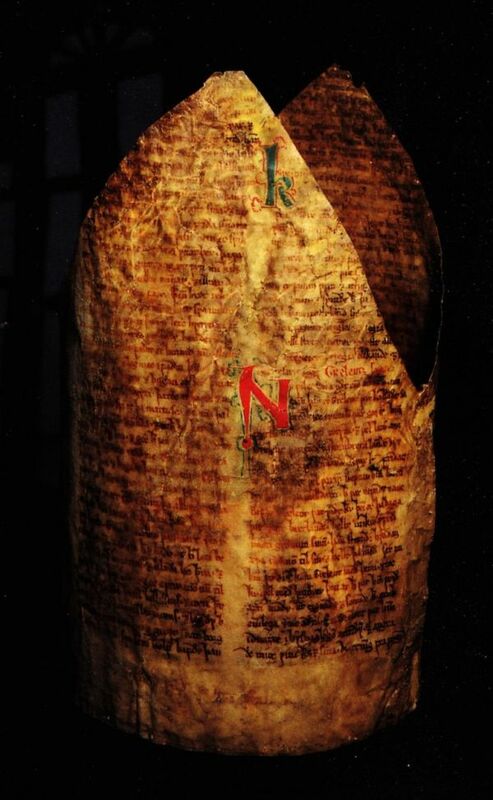 The parchment was not brought into the Convent for the purpose of lining. In fact, the manuscript fragments that have been discovered are recycled materials that include liturgical manuscripts and legal texts. Book recycling was common in the late fifteenth century, as evidenced by a manuscript from the Bodleian’s own collection (below). Because this was a period of religious reform, liturgical texts became outdated particularly quickly, accounting for their use as dress lining. And while this may seem to be a unique affair, the use of medieval texts was not just limited to convent clothes. In fact, at times things took an ironical turn – as was the case with the above pictured bishop miter. Clearly illuminated by the tepid light, the ‘hidden’ medieval manuscript pages come from a 13th century AD Norwegian translation of Old French love poetry (known as lais). Having literary passages like “lovers chasing each through dark corridors” and “maidens frolicking in the fields”, suffice it to say that the irony is pretty clear, especially when the priest was performing his religious rites with the miter atop his head. Rather than disappearing into the pots and pans of glue makers, the dismembered books were to have a second life: they became travelers in time, stowaways in leather cases with great and important stories to tell. Indeed, stories that may otherwise not have survived, given that classical and medieval texts frequently only come down to us in fragmentary form. The early history of the Bible as a book could not be written if we were to throw out fragment evidence.